WHAT: The 28th annual Whitworth Writing Rally is a family literacy initiative for students in pre-school through 6th grade. 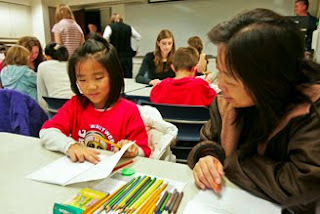 The event features presentations by a well-known children's author followed by opportunities for participants to work with area teachers or Whitworth education students to create their own original illustrated books. The rally is a nonprofit event that brings a variety of civic and corporate sponsors to campus and draws children from across the region, many of whom attend throughout their elementary-school years. This year, student participants are expected from 15 local public school districts and 11 private schools, in addition to a number of homeschooled students. WHO: The 2012 Whitworth Writing Rally will feature Tony Abbott, author of roughly six dozen books for children and young adults. Abbott primarily writes chapter books for early readers. His most popular works include the fantasy book series The Secrets of Droon, which includes more than 40 books. His other works include the critically-acclaimed Firegirl, as well as The Postcard, winner of the 2009 Edgar Award by the Mystery Writers of America for Best Juvenile Mystery Novel. Abbott's two newest books, part of the Goofball series, were released in late February. WHEN: Saturday, March 17. Sessions begin at 8:30 a.m. and 11 a.m. and run for two-and-half hours each. A parent or guardian must accompany each child participating in the rally. A number of Whitworth students have volunteered to accompany children whose parents or guardians cannot attend. Parents and guardians who can't accompany their children should call Kathryn Picanco at the contact number below. WHERE: The author's presentation will take place at Whitworth's Cowles Memorial Auditorium. Subsequent book writing sessions will occur in various classrooms on campus. The event will end at the Hixson Union Building's multipurpose room. All locations are on the Whitworth University campus, 300 W. Hawthorne Road, Spokane. COST: Registration is $18 and pays for a T-shirt, snacks, writing and art supplies, a reception, and participation for one child and a parent or adult guardian. Partial and full scholarships are available. HOW TO REGISTER: Register online at www.whitworth.edu/writingrally. If you have any questions, please call (509) 777-3459. The registration deadline is Monday, March 12. The Whitworth Writing Rally is an opportunity for children to develop their reading and writing skills with assistance from a professional author and trained educators. Each session will start with a one-hour presentation by Abbott, during which he will discuss how he got started as a children's fiction writer; the concepts of character, setting, conflict; how to find stories; and rewriting, revising, and self-editing. He will also present a slideshow on a day in the life of an author, including stages of the publishing process. "My goal in visiting with students is to inspire and motivate readers and writers of all ability levels," Abbott says. In addition to Abbott's presentation, a local children's dance group, Muse, will perform. An interpreter for the deaf and hard of hearing will also be present. After Abbott's presentation, students will move to classrooms on campus, where they will spend about 90 minutes participating in a guided lesson and writing an original book through brainstorming ideas, planning, writing, and publishing their book in final form. After the rally, students are invited to attend a punch-and-cookies reception in the multipurpose room of the Hixson Union Building, where they will have the opportunity to share the books they created. They can also meet Abbott during the reception, and he will be available to autograph his books. Certain local schools have made it a tradition to send a large group of students to the rally annually. This year, Regal Elementary School in Spokane plans to send 40 students from kindergarten to sixth grade. Kathryn Picanco, director of the Writing Rally, says scholarships will be available for some students, based on both nominations by school principals and financial need. "Scholarships are made possible by donations from students and faculty at Whitworth as well as community sponsors," Picanco says. "We want everyone to have the opportunity to attend the event if they would like to." Picanco, who is also an assistant professor of education and the director of the Center for Gifted Education and Professional Development, encourages Whitworth students to participate as teachers and assistants at the rally. "The Writing Rally is a fantastic community event celebrating literacy," she says. "Participants will come away inspired to read and write in new ways, as well as feel a sense of accomplishment in what they created." Kathryn Picanco, Writing Rally director, assistant professor of education, Whitworth University, (509) 777-3459 or kpicanco@whitworth.edu.